A nonsense ballad by Lewis Carroll to parody overwrought and poorly-written yet seriously-intended poems. It appeared in Through the Looking-Glass, the second of Carroll's Alice books. Some of the nonsense words invented by Carroll for the poem — like "vorpal" and "chortle" — have entered usage and become semi-official words. Be aware that, while "Jabberwocky" is the name of the poem, the eponymous monster is the Jabberwock. It is also said to have been inspired by a tree. Make of that what you will. Carroll's The Hunting of the Snark is a Spiritual Successor to this poem, and features several of the same creatures, though not the Jabberwock itself. In 1977, Terry Gilliam made a very, very loose movie adaptation, also titled Jabberwocky. In 1999, prog rock keyboardists Clive Nolan and Oliver (son of Rick) Wakeman recorded a Concept Album based on the poem, with Wakeman Sr. reading bits of the poemnote not always 100% accurately between the songs. Absurdly Sharp Blade: The Vorpal Sword, which decapitates the Jabberwock in two slices. Achilles in His Tent: Briefly. The Hero stops to rest by a tree, and then stands there for a while in "uffish thought" (basically, sulking). All There in the Manual: Carroll created definitions for his nonsense words. And There Was Much Rejoicing: The Jabberwock's death elicits this reaction. Audible Sharpness: "The vorpal blade went snicker-snack!" A Winner Is You: "And hast thou slain the Jabberwock? Come to my arms, my beamish boy!" Big Bad: The Jabberwock is one of three feral beasts mentioned by The Hero's father, and the one he sets out to slay. Book-Ends: The first and last stanzas are identical. The Dreaded: The Jabberwock, considering the fact that the whole town cheers when it's slain. Feathered Fiend: The Jubjub bird is mentioned to be a dangerous creature. Makes Just as Much Sense in Context: Unless you've read Carroll's definitions, the entire poem is an amalgamation of nonsensical words jumbled together that vaguely tell the story of a boy who slays a monster. No Name Given: Neither The Hero nor his father are mentioned by name. Off with His Head! : How the Jabberwock dies, being decapitated with the Vorpal Sword. Our Dragons Are Different: The Jabberwock resembles a dragon in the illustration, although the prose's description of it is rather vague. Public Domain Artifact: The Vorpal Blade is in many Tabletop Games and Video Games as a sword that tends to chop heads off. Red Eyes, Take Warning: When the Jabberwock attacks the boy, he is described as having "eyes of flame". 24-Hour Trope Clock: Brillig is four o'clock in the afternoon, just when you start to broil things for dinner. Unsound Effect: The Vorpal Sword goes Snicker-Snack. 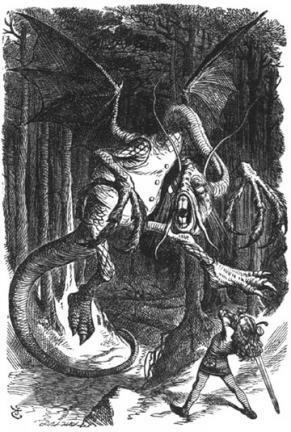 Waistcoat of Style: John Tenniel's illustration depicts the Jabberwock wearing one.